Karter Dolan (left) and Tanner Sabol (right) in ‘Mr Burns: A Post-Electric Play.’ Photo by Brad Reissig. The UND Department of Theatre Arts presents Mr. Burns: A Post-Electric Play by Anne Washburn with music by Michael Friedman April 17-21 at 7:30 p.m. nightly in the Burtness Theatre. Tickets are $15 for adults and $5 for students. Call the box office at 701-777-2587. 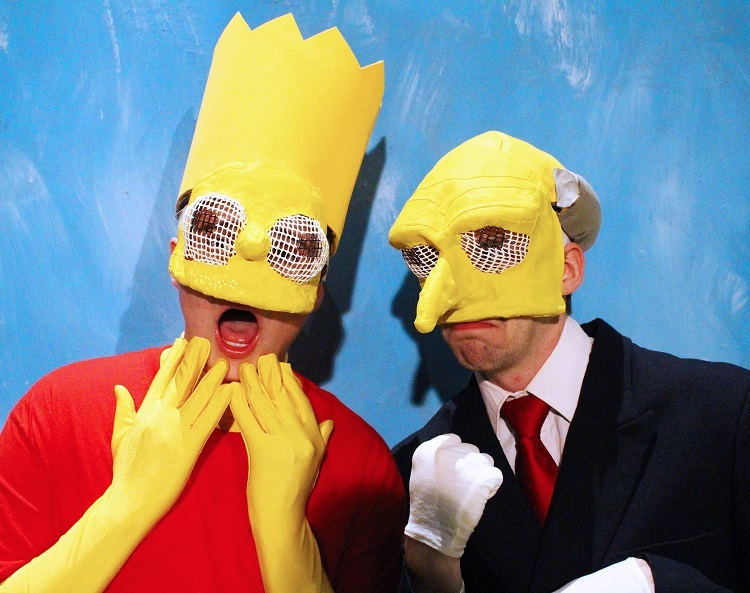 Mr. Burns: A Post-Electric Play is a modern dark comedy in three acts. After surviving a nearly apocalyptic global event, a group of survivors find themselves together and recalling one of the most infamous episodes of The Simpsons. Seven years hence, we find these survivors have formed a theatre company that focuses on performing episodes from the animated comedy. Numerous decades later, their efforts have evolved into a musical production, which is no longer accurate, but fits the cultural realities faced by a post-apocalyptic society. Mr. Burns: A Post-Electric Play debuted in 2012 and was nominated for the Drama League Award in 2014. The play itself has even made its way into an episode of The Simpsons! Please join our students, faculty, and staff at the Burtness Theatre for UND Theatre Arts’ final production of the academic year.